Where Has The Bachelor Been All My Life? 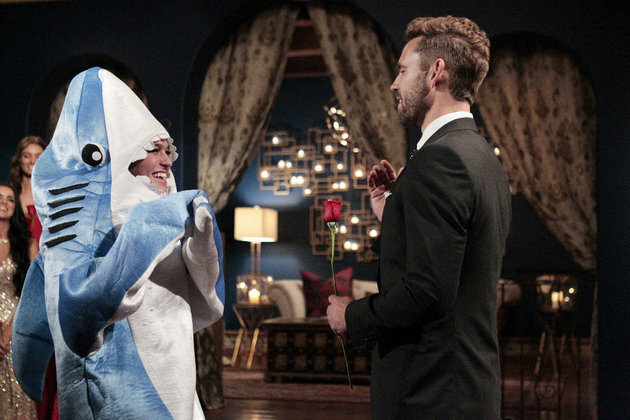 I’m not entirely certain why I wasn’t watching The Bachelor before this season, but I became intrigued when I caught the news that a contestant on this season’s show showed up to the first night in a shark costume despite describing her wishes to become a dolphin trainer. This seemed funny and was amazing. So from Alexis alone, we were in on watching, despite having no idea how The Bachelor worked. But despite flying blind into this season, the preview video of what was happening on this season we were excited to try the first episode and root against Corrine, who may be the best character on television at the moment. This is some especially wonderful reality TV, and there’s nothing better than a show that is amazing at what it attempts to accomplish. The Bachelor isn’t trying to win Best Drama at the Emmys – It’s trying to be the most dramatic show on television and succeeding. This season also doubles as a rewarding one for longtime fans and newcomers like myself. This season’s Bachelor – Nick Viall – has been on two seasons of The Bachelorette and last year’s Bachelor in Paradise despite being dumped at the last possible opportunity twice. Long time watchers are well aware of Nick’s past on the show, making for an extremely familiar program, but I don’t have a three-year history with the man. I get to judge him anew despite knowing that he is a loser twice over. He’s a goofy guy and looks to be perfect for a season of TV that’s primed to go off the rails almost immediately. Which is to say immediately given the Shark and Dolphin debate. I have no idea what is going to happen this year, but I sure as hell know I’m in for the long haul on this thing.